Computer Aided Manufacturing is what CAM stands for and it is used to program CNC machines. CAM software has the ability to streamline the machining process, allowing users set up a job in a “Job Tree” so they can organize their workflow, set Toolpaths and run simulations of their parts being cut for diagnostics. CAM will also create the g-code for their CNC machine to follow while cutting. Generally, CAM starts with a Roughing cycle to remove bulk from the material. As the cycle nears completion, semi-finishing and finish Toolpaths refine the part into something that is ready to be handled or distributed. What is a CAM Plug-In? 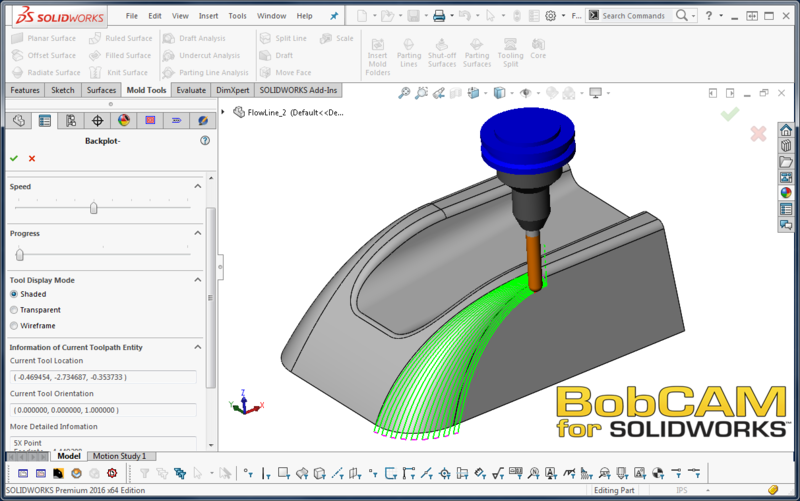 BobCAM for SOLIDWORKS, a Gold Partner CAM add-on, provides fast access to powerful machining strategies capable of handling your most complex parts.The way it works is BobCAM works directly inside your SOLIDWORKS program, allowing you to create 2, 3, 4 & 5 Axis Toolpaths and generate g-code for your CNC machine. For a more user-friendly experience, BobCAM’s software provides the user unique machining wizards for all Milling strategies. These wizards are sort of a fool-proof way of setting up your machining strategy, taking users step-by-step. The latest module offers standard 2 Axis machining capabilities, multi-tool drilling and add-ons for 3, 4 & full 5 Axis simultaneous CNC Milling. First, you will want to set up and save all the specific features of your machine in the “Job Tree” of your CAM software. This is first and foremost because it develops programs that are specific to your machine, letting you easily set up similar jobs in the future (editing as needed). Next, identify your stock, setting initial work coordinates, material type and the tools to be used for machining the part. After your stock has been addressed, it’s time to decide the Toolpaths to apply for your roughing and finishing cycles. Next, your “Job Tree” will need to be utilized. It allows users to easily change the sequence of the machining operations, giving you the most efficient machining process. 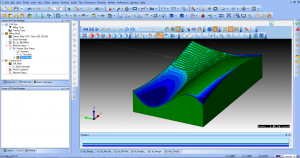 One of the best things about CAM software, like that from BobCAD-CAM, is the wizard guide that structures your job in a step-by-step approach. This is a solid way for users enter all their information correctly, ultimately reducing programming time and the chance of error. Once your starting points clearly identified (machine, tools, stock), you can move on to the next phase of implementing your machining operations. 1. Part Deviation Analysis – the software detects material that wasn’t cut by the tool or where the tool went too deep using multiple colors to measure different levels of deviation. 2. Expensive gouges and collisions are easily identified before there is a chance to damage your machine. 3. Easily calculate cycle times. After you have completed all of the aforementioned, you are now ready for post-processing. Users can associate machine configurations and post processors so that when choosing a machine, they also choose the correct post processor. You can also default a machine/ post. A post processor is a text file. This text file formats the g-code posted by the CAM software. Since the post processor is a text file, anyone can make changes to it, making it easy to customize g-code formats. We have a huge library of post processors for the most common/ popular machines. Can’t find your machine? We can create one for you specifically. Additionally, if you are new to making edits to BobCAD posts then you’ll be happy to know all the post variables and API calls are documented and come with the software, “C:\BobCAD-CAM Data\BobCAD-CAM V30\Posts\Documentation”. Click here to try BobCAD’s latest CAM software, BobCAD-CAM V30!